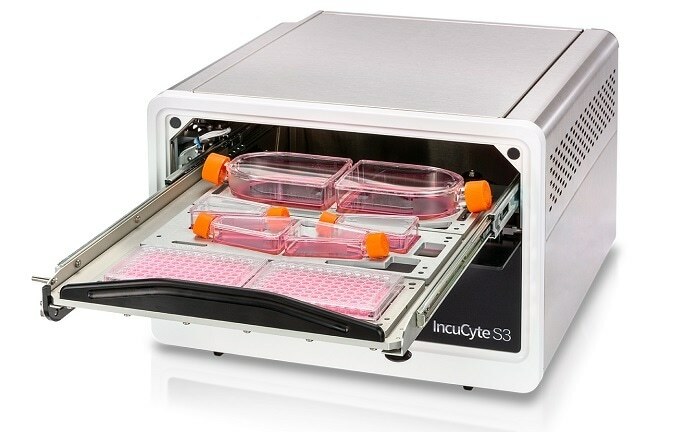 The next-generation IncuCyte® S3 Live-Cell Analysis System automatically acquires and analyzes images around the clock, enabling you to derive deeper and more physiologically relevant information about your cells, plus real-time kinetic data — without ever removing your cells from the incubator. Change can happen in an instant. Whether simply assaying cell health or more complex processes like migration, invasion, or immune cell killing, see what your cells are doing and when they do it. The IncuCyte® instrument, proprietary assays and reagents provide you with the ability to gain new insights into biological processes via real-time, quantitative analysis of live cells. Conventional approaches to cell analysis only capture a single time point, enabling only single-point and end-point measurements, and cells are perturbed or destroyed as part of the assay process. The IncuCyte system offers the advantage of performing live-cell analysis without ever having to displace cells or disrupt their surroundings. The system automatically and continually collects and analyzes images throughout the course of an experiment while cells remain unperturbed in a physiologically relevant environment. Furthermore, the IncuCyte accommodates multiple users and applications seamlessly and combines information-rich, image-based analysis with the convenience and throughput of microplate assays. The new IncuCyte S3 builds on the established IncuCyte technology that is featured in over 1,000 peer-reviewed publications. The S3 offers a completely reimagined user interface, enabling even first-time users to set-up an experiment and begin acquiring images within minutes. Image viewing, analysis and graphing is similarly streamlined – images from a 96-well experiment can be viewed simultaneously, then converted into movies, metrics, and corresponding publication- and presentation-ready graphs with just a few clicks. In addition to improving productivity for the individual user, the IncuCyte S3 empowers an entire research team. Multiple users can run multiple applications on the IncuCyte in parallel, reducing time spent waiting for an instrument to be available. In addition, data is accessible remotely to any user via unlimited, free networked licenses. The IncuCyte and its unique features provide a powerful platform that enables researchers to devise new experiments not previously thought possible. In addition to the IncuCyte® platform, IncuCyte® proprietary reagents and analysis software are also available which enable researchers to perform real-time, quantitative live cell analysis and evaluate a wide variety of cellular processes over time. Never miss powerful insights again, with the IncuCyte S3 live-cell analysis system, reagents, and consumables.